We are pleased to announce that Friday 3 January 2014 will mark Don and Dave Hill's 50th anniversary of playing live together. 1964 Express and Star advert for the Three Men In A Boat gig. History shows that Don joined the band Johnny Travelle and The Vendors in early 1963. 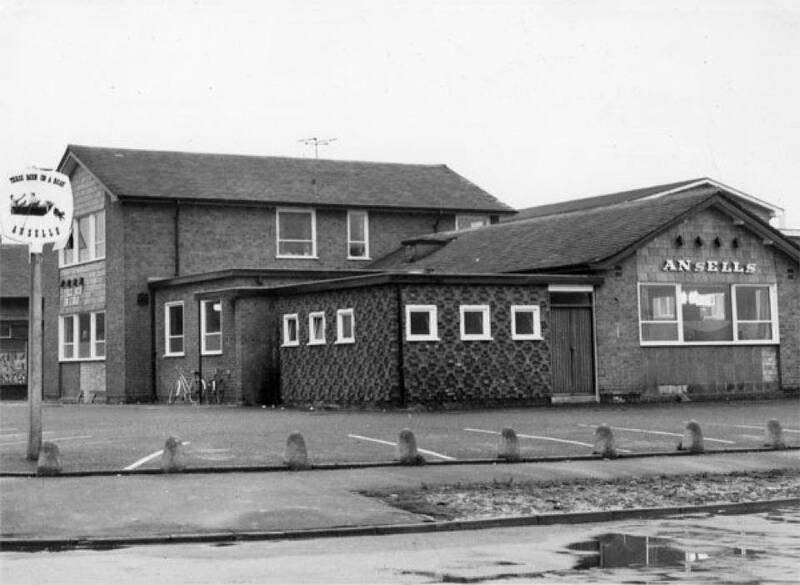 The first version of the band consisted of Don, Johnny Howells (lead vocals) and Mick Marston (guitar). Billy Diffey (bass guitar) and Johnny Shane (guitar) were added later in 1963. 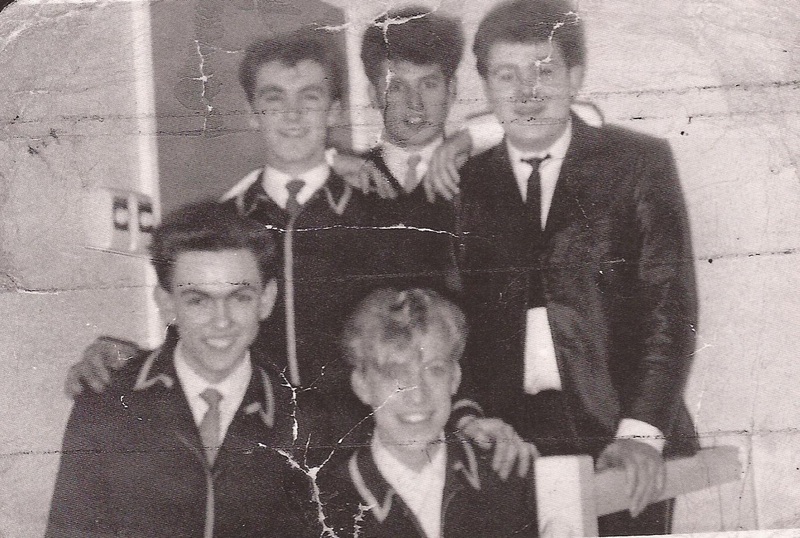 However, in December 1963 Johnny Shane decided to leave the band. Dave Hill was recruited as his replacement. Slade historian Chris Selby has traced and tracked all Don's gigs for years (and his work is shown on the "Don's Gigs" pages on this website). 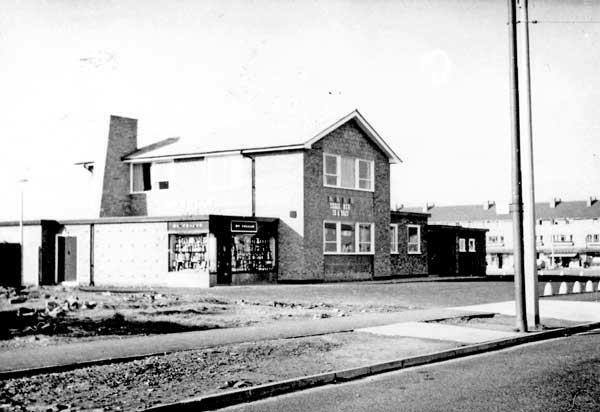 Chris has informed us that he has traced the first known gig The Vendors played after Dave Hill was recruited. 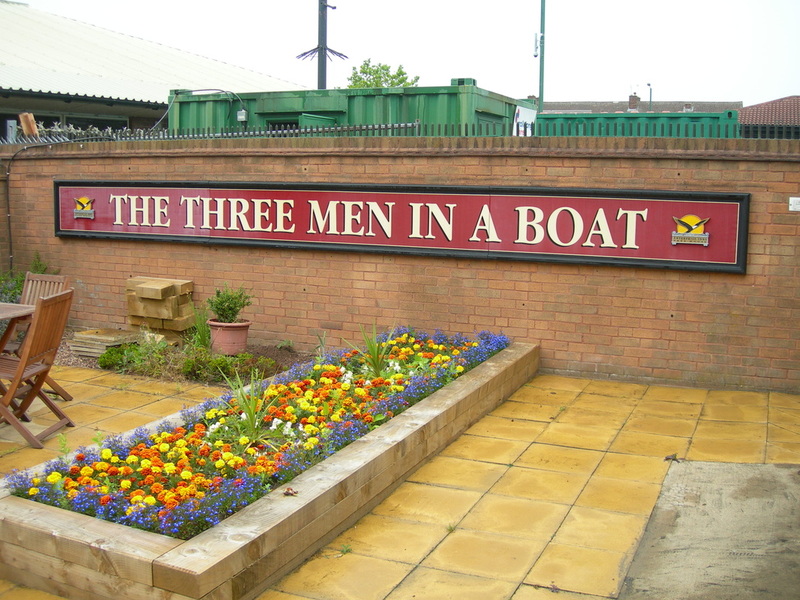 It took place on Friday 3 January 1964 at the Three Men In A Boat Pub in Walsall. Therefore 3 January 2014 will mark Don and Dave Hill's 50th anniversary first playing live together in concert. We applaud their musicianship, friendship and the entertainment that they have given fans around the world for the last 50 years. CONGRATULATIONS TO DON AND DAVE. 50 years together is an absolutely amazing feat. With thanks to Chris Selby for the research and use of picture images above - and to Sue Wilson for the recent Don and Dave pic. Dave and Don playing together for 50 years is an extremely remarkable achievement. Especially when you think about how well they are still performing on stage and keeping the spirit of Slade alive. 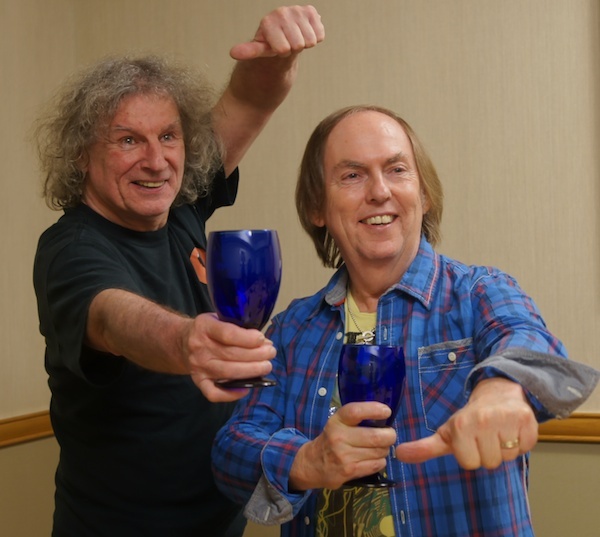 We will send our warmest and biggest congratulations to Dave and Don, and thank them for the fine moments with them by our Slade concerts (Ilpo: one Slade concert in Finland and 50 concerts of the new Slade) and the short but great moments with them outside the concerts. We hope that Dave and Don will still keep on touring for some years, and their 51st year together will bring out a new album. Stay health and Keep on rockin' ! Wow, stunning achievement. Very well done. I've never seen Slade live, so keep going guys, & this year I'll be along! I have followed the band all my life got nearly every recording. I still feel the same excitement whatever the track or time of day. This group were and are special, never to be repeated well done boyz. From Andy 50 yrs old also. 50 years in a boat! WoW! Congratulations from Germany you both! Keep on rrrocking! Wot an achievement! I have been a Slade fan since September 1972 - Mama Weer All Crazee Now - Thanks for the music the great times and memories - STILL THE GREATEST BAND EVER. Keep on Rocking! Well, what can I say!!!!!!!. Don Powell and Dave Hill, You have done me proud for the last 45 years. We must not forget Nod and Jim!!!!!!!!. I would like to thank Dave and Don for the pleasure that they gave me over the years and be able to have met them in person on several occations before and after their Live Gigs. Dave and Don, thanks for signing my Super Yob Guitar!!!!!!!!!. Fantstic!!!!!!. From a long standing BELGIAN SLADE FAN since 1970/71!!!!!!!!!!. So, well done and hope to see ya at the next Slade Gig in the Midlands.All the best for 2014. 'KEEP ON ROCKIN' and Mama Weer All Crazy Now!!!!!!!!!!!!!!!!!!. A massive congratulations to Don & Dave, 50 years together is an amazing achievement. I have seen you with the current line-up of Slade many times, including the latest tour with Sweet, and you can still rock better than most young bands. I look forward to seeing you again in 2014, and hopefully have the chance to hear a brand new album from you, so you can prove that 'Slade Are For Life - Not Just For Christmas'...Keep On Rockin' !! What an achievement and still going strong. Great gig at Dartford Nov 10th. How many artists these days can boast gigging for 50 years. None. I bet.Dave+Don represent the super groups of our day and stand along side such greats as The Stones, The Who and Quo. May they gig for many years to come and give us many more enjoyable evenings out. Also would be nice to have an album out of new material. The boys must have stuff in the pipe line. I'd like to hear a longer version of "Me hat, Me coat". Thought was a fantastic instrumental. Keep on rocking, your fan for life. Thanks for the ride boys. It's been a great journey. Keep on Rockin'. Half a Century - Holy Smoke!! Only saw you once on Slade's 'second coming' at Newcastle City Hall c. December 1983 which was recorded live that night. I stood on the seats under the balcony and screamed into the mic most of the night which must have been a bugger for the sound engineer to remove!! 'Merry Christmas Everybody' (recorded live and kickin' at Newcastle CH) was used on the B-side to the gold selling 'My Oh My' single that year (in the UK) and I was absolutely delighted when I fired it up and could actually hear my faint but awful wailing cat broken teen vocals in patches during the crowd chorus. Of course, your biggest hit for nearly ten years was all down to me... ha ha !! You guys have rocked with me since I was 11 years old in '72 - and we still love rocking with you now! You've given us all so much pleasure with your incredible musicianship - long may you continue ....KOR...thank you! Fantastic achievement well done Dave and Don. True legends. Many congratulations to you both and thank you for all the fantastic music, gigs and memories over the years. 50 years this week since the first seed of Slade was sown eh?Well done and congratulations! After having a fun filled time at G Live in Guildford on 17th December,with Dons powerful drum playing and Dave's amazing guitar,cheeky smile and,yes,still outrageous clothes,it seems we will be able to enjoy the mighty Slade for many years to come! How wonderful for Don and Dave to have had a friendship for so long, on a sometimes,very rocky road. Thanks for the (happiest) memories guys! I am sending congratulations to two of the greatest rockers ever (FACT!) from Sydney, Australia. Thanks for keeping me so informed by your website. Hopefully you will return to Oz one day! Fantastic achievement. You helped me through boring schooldays, as I was more interested in having my ear glued to the transistor radio I had in the early seventies when Slade were being played. Been to some fantastic gigs, including the great 8th March 1980 gig at St.Austell - sold out and a blinding show. Have really appreciated the time you have both spent making sure the fans have gone away happy. Congratulations to you both, and Thanks for the Memories!! Stay healthy, happy, and hopefully on road for as long as you both enjoy it!! Congratulations, and THANKS for all the noize over the years. You helped me get through many a boring school day in the early seventies when I used to look forward hearing Slade on my `transistor radio` (remember them?) whenever I could. I used to have the radio more or less stuck to my ear when you were on, and later going to the gigs and eventually having my own singles/albums, cassettes and then CDs might not have helped my hearing, but has still kept me loving your music even though i`m approaching 53!! Congratulations on your 50 years anniversary! Thanks so much for all the Joy you've brought into the lives of your many fans!! You boyz have been in my life since 1971. My elder brother knew you as the N Betweens before that. I was at those riotous gigs at the Civic Hall in the 70's. Don, your bad time was with our school wall. We were all behind you, willing it all to be ok again, and it seems like it was eventually, although it took some time (I read the book). The late 70's were rough but I remember hearing the live version of "When I'm Dancin" on Radio 1 and knowing it would be ok again. "My Oh My" was the icing on the cake. Bad news came in 1992 when Nod and Jim left - but you two had the courage to carry on and you were right to - you two were the founder members. So, Don and Dave, congratulations on 50 years together. Thanks also to Nod and Jim for the part they played. All of us fans yearn to see the four of you play together again - but I guess "its complicated". Thank you for making our lives better - you made the good times brilliant and the tough times easier to get through. Steve, Theresa, Lucy and Laura. Congratulations to you both on your 50th anniversary of working together. Somebody should get you a clock or a gold watch! Thanks for the wonderful music and performances you've given to us over the years, the crazee stage outfits that we've all tried to copy (sometimes very badly! ), the twisted ankles from wearing platforms and trying to run after your car following a show, the deaf ears from playing it loud, and the incredible memories of meeting you and having photos and autographs galore. You've always been the lads next door who made the big time but never forgot your fans or where you came from. There are a lot of so called "stars" who could learn a lot from you in that department! "Wild nites, we had some wild nites with you. wild dreams and all of my dreams come true!" Lots of luv, hugs and glitter! Good to see you're still enjoying playing live after all these years! If Jim could fix it for me to be with you both tomorrow I will buy the beers all day. Fantastic achievement and it's great you're looking both so well boys. Dartford gig was brilliant. Thanks for the signed book from Sheffield Don. Happy new year to you and all your Family from a 54 year old fan. Congratulations on your 50 years together and for the concert on the 21st December it was a brilliant night and look forward to seeing you both again one day. Congratulations on 50 years of playing music together, a fantastic achievement. I have been a fan for 40 odd years with my first gig being Earls Court. Thank you for all the fantastic music and gigs. Don, thanks for the inspiration to become a drummer myself. Two men who still remained in a boat . Congratulations from Polish SladeFan Pio. It was a pleasure to see you again in Walsall and chat about the good old, bad old days! A great drummer and a thoroughly decent bloke. Well done on your fifty years of rockin' out with Mr Hill. Maybe get together for a jam sometime this year. You've got my email. A marvellous achievement-grew up with Slade everywhere and still in my fondest memories of teenage years!! Any chance of a first gig in Ireland-still waiting after 50 years for you to visit! Thanks for keeping Slade alive !!!!! You Guys rock !! 50 years of pure rock what more can you ask for....Especially thanks to Dave and Don. Gentlemen you are, keeping the fire glowing through the 50 years. Thats when I met Dave Hill at the Varberg Stadshotell(Sweden) and what a gentleman he is. We talked about life in general. So I bow to the gentlemen Dave and Don for the music, stay healthy and keep up the great work of Slade. Many congratulations on 50 years and still smiling. Hopefully we will have many more years of coming over from Northern Ireland to see you and hopefully see you back in Belfast soon. Looking forward to the new album this year. Congratulations to The SuperYob and The Banging Man. 50 years of rocking. Keep On Rocking! I have been a fan of you guys for over 40 years and I congratulate you both on a great achievement of keeping this great music alive. All the best for the future' keep on rocking'. Hope to see you in Perth Australia again some day. I am a Belgian fan of 30 years. Thanks for the joy you have give me over this time Don and Dave. Keep well. Keep healthy. Keep happy. Thanks Dave and Don. I have had some great times following the Ups, Downs, Ups, Downs and Ups of your career. Thanks for the concerts and thanks for the great music.